A couple of weekends ago a friend of mine decided to try out a 13 kilometer hike that she'd heard of around Murrhardt, and asked if we wanted to join. And so early one Saturday morning we packed a day pack with water and snacks, suited up Leo in his harness, and headed to the Hauptbahnhof to take the train to Murrhardt. We arrived at our scheduled platform about 10 minutes early, when we saw that another train which had been delayed was still waiting to leave. Not a big deal. I was content sipping on my Pumpkin Spice Latte from Starbucks as we waited for the other train to leave. So we waited. And waited. And waited. Determined to go on some kind of hike (and make use of the Baden-Württemburg ticket that we'd purchased for the four of us -- Leo included), we decided to hop on the next train leaving for Heidelberg instead. From Stuttgart, it only takes about 45-50 minutes on a regional train, so it's very close, and the city is easily walkable, making for a great day trip. Matt and I have been to Heidelberg on a couple of other occasions, and I loved the area both times. But this was the first time visiting for my friend, and so we wanted to make sure we covered all the big to-dos. After picking up a good old-fashioned paper map at the tourist office in front of the main station, we headed out to the Neckar River on foot and walked along the river until we got to the Theodor-Heuss Brücke (bridge), snapping pictures all along the way. From there, we crossed the bridge to start on the Philosopher's Way up the mountain. But before we started out on our hike, we made a brief pit stop at Divino, a little Italian wine and coffee bar just a block or two in along Brückenstraße. A friend who lived in Heidelberg for a while told me about this little eatery, which offers the most delicious grilled paninis to go. I purchased a salami and cheese panini and a grilled vegetable and cheese panini for me and Matt, both of which were grilled fresh in front of me. Divino also offers a number of tasty looking Italian salads with eggplants, peppers, and tomatoes, so you could easily make a picnic basket. Tip: If you don't have a wine key on hand, then go for a bottle of champagne or sekt. You can pop the cork on your own and enjoy a little bubbly with your lunch. After our quick snack, we crossed the street to pick up the beginning of the Philosophenweg, or Philosopher's Way as it's called in English. This lovely path winds its way up the Heiligenberg or Saint's Mountain, and is said to be the traditional path taken by the philosophers and professors of Heidelberg University. We followed the path until we got to the Philosopher's Garden and its beautiful look-out point across the city. From there, we turned left and headed up the steep side of the mountain on our hike. There are many winding roads and paths up the mountain, so unless you want to get stuck heading round and round the mountain on a loop, as we did on our first time, then I suggest you use the map given to you at the tourist center (Apple maps will not cut it here as many of the trails aren't visible). Though steep, the walk isn't very far. I think we made it in 30-45 minutes at a gradual pace with frequent stops to look at stuff. There are several cool lookout towers and ruins to see along the way, including the ruins of the Stephanskloster which date back to 1090. There's a great look-out tower there with some lovely views of the city, as well as the foundations of the tiny church. Farther up is a massive Nazi-era amphitheater called the Thingstätte, which is one of about 40 built across Germany. It was built in 1935 and opened to a crowd of about 20,000 people by Joseph Goebbels, who meant for it to be a place for propaganda events and worship under the Nazi mystique, which is the reason for it being built on the Heiligenberg. However, the Nazis soon favored the ease of the radio and the amphiteahter was never really used for its given purpose after that. The amphitheater is enormous, and it's easy to see how how such a setting would have been found awe-inspiring by the Nazis. Matt and I found it more than a little ironic that on our first visit to the theater, which was constructed to transmit the Nazis' message of superiority and hate (among other points), there were groups of mix-raced youth having an impromptu party, families picnicking on the stairs, and some non-Aryan children playing football (soccer) on the main stage. It was a peaceful place for all, and I was glad to see the amphitheater being used this way. After walking around the amphitheater, we headed up to the top to see the 11th century ruins of the Michaels-Basilika. This monastery was founded in the 9th century, though there are other, older Celtic and Roman ruins beneath the foundation. On this particular sunny day, there were a good many picnickers and sunbathers enjoying the areas around the ruins, making for a nice atmosphere. Our hike complete, it was time to head back down and reward ourselves with a nice, cold beer. One of the things I love about Germany is that you tend to find biergartens along many walking trails, and this was no exception. The Waldschenke has a great location next to the Thingstätte, and serves traditional German food and beer. You can technically drive up the mountain, park at Waldschenke, and then walk a few paces up to see the amphitheater and monastery, but I think the hike up the mountain is much more enjoyable. After all, beer always tastes better when you feel like you've earned it. After our beer, we made our way down the mountain and took the Alte Brücke (old bridge) across the Neckar in the heart of the Alt Stadt (old city) of Heidelberg. This beautiful area features tons of half-timbered houses, cafés, shops, and churches, most notably the imposing late-Gothic-style Heiliggeistkirche or Church of the Holy Spirit in the Marktplatz. I always experience a bit of a time warp when coming to this area of Heidelberg, though I will say it's one of the most touristy areas I've been in in Germany. The crowds can be a bit overwhelming late in the day, and I hear more English spoken here than in Stuttgart for sure, which might be explained by the US Army garrison there. On this day, we whipped through the old town and headed up (once again) the steep incline of the Königstuhl (King's seat) to the castle. You can, of course, take the old funicular up the side, but we instead decided to walk up the 300 or so steps to the top. The castle was originally built in the 13th century, but suffered many fires, wars, and rebuilding periods since then. 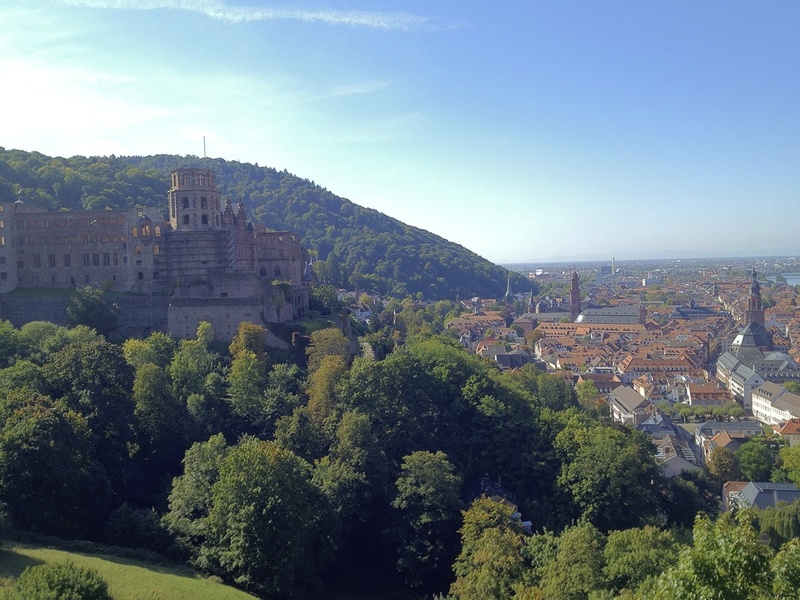 Right now the castle is mostly in ruin, but you can go see a few of the rooms, including the cellar with the enormous Heidelberg Tun, a large wine barrel that can hold 58,000 gallons of wine, and an interesting apothecary museum. However, I find the ticket price to be rather expensive and don't really recommend paying it when you can just as easily enjoy the castle garden and views for free. Definitely be sure to walk around the castle to see the ruined Powder Turret, which was described in Mark Twain's 1880 travel book A Tramp Abroad. I think it must be one of the most photographed parts of the castle for its ruined beauty. With the day quickly ending, we decided to head back to Stuttgart, and so we wound our way among tourists and souvenir stands down the Hauptstraße and back to the main station. Should you have more time and enjoy shopping, definitely give yourself a good hour or two for this, as there are a lot of cute shops here. I like the Alte Brennerei shop with its many fruit liquors and jams to sample. You can find some great gifts here for friends and family back home. You'll also see lots of shops selling Schneeballen, meaning snow balls. They're a kind of pastry made from shortcrust that's balled together and dipped in everything from cinnamon sugar to nutella or pistachio crumbs. You should try one while your in the neighborhood, but be forewarned that they're not as sweet as they look (no German pastry ever is, really). Florian Steiner Kaffee -- One of my husband's coworkers took us to this little coffee shop to begin our day. It's one of his favorite (and he says one of the best) coffee shops in Heidelberg. They roast their own beans, so whether you go for a cup of coffee or a cappuccino, you're guaranteed a good cup of joe. Hugo Wine & Dine -- The same friend who told me about Divino's told me about this place. This cozy little Italian restaurant with its stone floor, walls lined with wine bottles, and dim candlelight serves up a number of rotating dinner specials, including beef, lamb, fish, and vegetarian risottos and gnocchi. It's located a few blocks away from the touristy downtown area, so you're guaranteed a quiet area for dining. 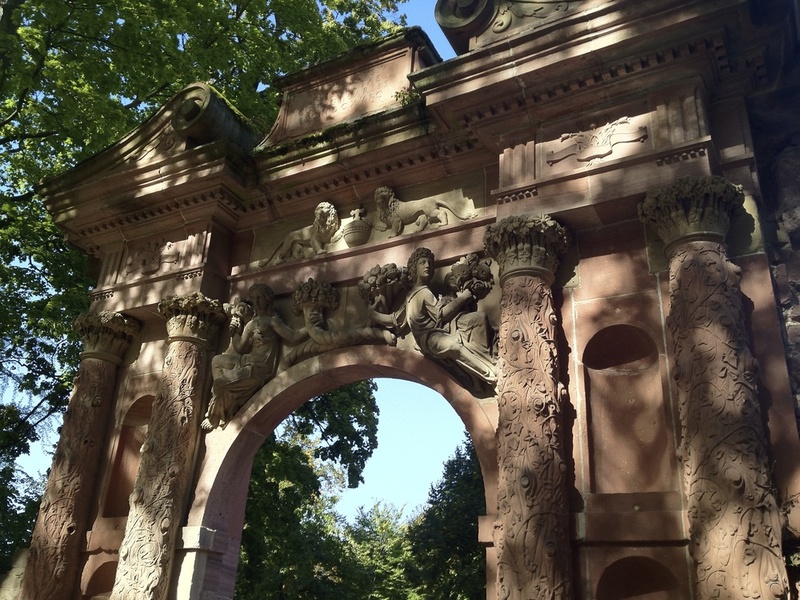 Heidelberg University -- Apart from the romantic castle and views of the Neckar, Heidelberg is also known as the home to Germany's oldest university. Dating back to 1386, the campus of Heidelberg University is spread out, but you can easily see the old university library while walking through the Alt Stadt downtown. The Heidelberg student prison is also located in the area, and though I've never been, I've heard it's worth a peek to see the many writings and images done by students who were incarcerated for disturbing the peace and skipping lectures, among other offences. Have you ever been to Heidelberg? What were your favorite sites and restaurants?